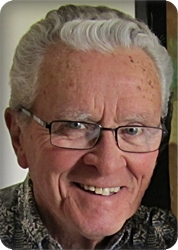 Our beloved husband, father, and grandfather, Jerome "Jerry" Miller, age 81, of Caledonia, went home to be with his heavenly Father on Friday, November 23, 2018. Jerry proudly served his country in the U.S. Navy and retired from Michigan Bell Telephone after 25 years of service. He was preceded in death by his wife, Patricia; brother and sister-in-law, Leonard (Agnes) Miller; sister, Edith Matthews; and sister-in-law, Bea Miller. Jerry will be lovingly remembered by his wife, Marian; children, Kelly (Sam) Raymor, Kathy (Terry) Nyenhuis, Kris (Will) Foote, Jerry Miller, Jimmie (Sherri) Miller, Holly (Jason) McGavin, Deborah Meurer, Gregory (Stephanie) Hansen; 25 grandchildren; 26 great grandchildren and two great-great grandchildren; brother, Bill Miller; brother-in-law, Terry Entrican; sisters-in-law, Joyce (Dale) Benedict, Barbara Brower; many nieces and nephews. Visitation will be held on Sunday, November 25, from 2 - 4 and 6 - 8 pm at Stroo Funeral Home, where the funeral service will be held on Monday, November 26, at 11:00 AM. Memorial contributions may be given to Faith Hospice. I am so very sorry for your loss. My thought and prayers are with you at this difficult time. Jerry will be truly missed. Thoughts & prayers for your family. My thoughts and prayers are with all of you in this time of loss. Terry Miller was like a father to me for most of my life. I remember him fondly with joy and the never ending love that he had for his family. Rest in peace Jerry. I loved being at your house. I have so many good memories at your house. Your parents and family were like my second family. He was a amazing man loved by many.